Aloes placed in this section are stemless or have very short stems. The leaf rosettes are close to the ground. The flowers of the stemless Aloes are considered to be amongst the most spectacular of those Aloes included in this group. They are quite large in relation to the plant itself. The Aloes that have been placed in this group are only related by the stemless characteristic and may be completely unrelated otherwise. Left: Aloe krapholiana photographed in habitat, +- 10km to the east of Kleinzee, Northern Cape, Namaqualand. Aloe aculeata * - Aloe aculeata is perhaps one of the most well known Aloes to South Africans as it was depicted on the old nickle 10 cent piece. The species name 'aculeata' means 'prickly' refers to the leaf surface that is covered in little spikes. Aloe broomii - The specie is named after the well known anthropologist Robert Broom, the first collector. Aloe broomi is commonly called the Bergaalwyn and the Slangaalwyn, the former referring to the Aloes habitat and the latterreferring to he shape of the inflorescence. Aloe buhrii - The specie name 'buhrii' was derived from Elias Buhr, a farmer from the Nieuwoudtville, who first collected it. Aloe chabaudii - This specie can be found in the Northern Province, Mpumalanga and KwaZulu-Natal of South Africa. Aloe chabaudii flowers during June and July. Aloe chabaudii was named after John A. Chabaud. Aloe chlorantha - The species name 'chlorantha' means 'green flowers' and refers to the green colour of the flowers which is a distinct and uncommon colour in Aloes. Aloe cryptopoda - The specie name 'cryptopoda' means 'hidden foot' which was derived from the fact that the flower stalks are hiiden by large leafy bracts. Aloe gerstneri - Aloe gerstneri was named after Rev. J. Gerstner who first disovered it in 1931. Aloe glauca - The Specie name 'glauca' meansd grey which refers to the colour of the leaves, which are a greyish-blue colour. In South Africa Aloe glauca is commonly called 'Blouaalwyn' which literally means Blue Aloe. Aloe globuligemma - The species name 'globuligemma' means 'globular bud' and it refers the the shape of the flower buds which are globular in shape. Aloe globuligemma is known as the 'Knoppiesaalwyn' in South Africa, translated it means Button aloe. Aloe haemanthifolia - The specie name 'haemanthifolia' is due to the similarity its leaves to those of a bulb genus called Haemanthus (March Lilly). Aloe herreroensis - Commonly called the 'Sandaalwyn' (sand aloe) or the 'Vlakte-aalwyn' (Plain Aloe) in South Africa. Aloe hereroensis' specie name was derived from where it was originally located in Namibia, the home of the Herero. Aloe krapohliana - the name 'krapholiana' is derived from the first collector of the plant, H.C. Kraphol. Aloe lutescens - The specie name 'lutescens' means 'becoming yellow' which refers to the red buds that turn yellow as the flower opens. Aloe melanacantha - The specie name 'melanacanth' refers to the most distinguishing feature of this aloes, its black thorn which is what the specie name means. 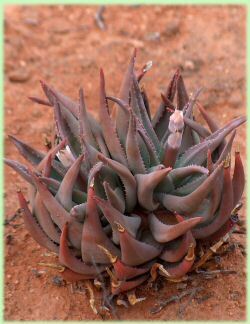 Aloe melanacantha is commonly refered to as Kleinbergaalwyn (Small Mountain Aloe) and Goree. Aloe peglerae - The plant was named after an early plant collector by the Name of Alice Peglar. Common names include Red-hot poker and bergaalwyn (Mountain Aloe). Aloe petricola * - The specie name 'peglerae' means 'inhabitant of rocky places' and refers to the type of habitat that Aloe petricola prefers. Aloe polyphylla - The specie name 'polyphylla' means 'many leaves' refering to the numerous leaves in the rosette. The Afrikaans common name is 'Kroonaalwyn' which means 'Crown Aloe' when translated. Aloe pratensis - Aloe pratensis received its specie name 'pratensis' from its prefered habit The specie name means 'growing in a meadow'. Aloe reitzii - Named after F.W. Reitz. A winter flowering variety called Aloe reitzii var. reitzii is also recognised. Aloe reynoldsii - Named after the well known Aloe fundi, Gilbert W. Reynolds. Aloe striata * - The specie name 'striata' means 'marked with lines' refes to the numerous conspicuous longitidunal lines that are present on the leaf surfaces. The English common name is 'Coral Aloe'. Aloe suprafoliata * - The specie name 'suprafoliata' refers to the leaves of young plants that seem to be on top of one another like an open book which is where the Afrikaans common name comes from, 'Boekaalwyn' (Book Aloe). Aloe thorncroftii - This Aloe was named after the person who first collected it, George Thorncroft.